When I wrote yesterday that today I would be posting about future projects and all that, I had forgotten something: today was Verena’s grandfather’s 89th birthday, and we were supposed to go visit him and his wife. And we did, which means that I have gotten no work done at all and am now entirely too exhausted to write a Compendium entry. I don’t really regret going, though. For one thing, both of them were very happy to see us. For some odd reason they seem to really like me, even though I’m a strange hairy foreigner. They’re a lot less formal and conservative than Verena’s other grandparents, and it’s a lot easier to talk to them, so hanging out with them is a lot less awkward than such situations tend to be. I guess I also feel that you should hang out with people while you can; I greatly regret not visiting my Greek grandmother, Eleni, before she died. I was in Germany and it was exams time and it wasn’t clear that she was going to die, but in retrospect… I should’ve gone. It’s not like I finished my damn studies anyway, and she would’ve been happy to see me. That’s how you grow older, I guess. You don’t change, you just accumulate regrets. Verena’s grandfather told us a number of fascinating stories from World War II today. We’d heard some of them before, but not all. Unlike some old people who just mechanically repeat the same stuff over and over, he’s genuinely telling the story, thinking about it, still wondering about why things were done this way and not that way. He told us about being at the Battle of Monte Cassino, about how the ground shook when the abbey was bombed. He still can’t believe the Allies did that when the Germans weren’t actually occupying it – in fact they had orders to stay away. He told us how the Germans removed all the treasures from the abbey and took them to safety to keep them from being destroyed, which was then reported as the Germans stealing the treasures. The soldiers were outraged by that. He told us about being a prisoner of war in Africa, about the conflicts between American and French-Algerian troops. How the French were almost as badly off as the prisoners themselves. He was a cook there, cooking for the other prisoners, so many of his stories have to do with food. Like how the Americans were burning supplies because they were about to reach their expiration date, while everyone else was starving. This was then brought to their attention, and they gave the hungry German prisoners truckfuls of supplies – but then the French came and took them for themselves. And then, after someone complained about this, a group of really tough American soldiers showed up, gave the French soldiers a really bad beating and returned the supplies to the Germans. Another bit that I thought remarkable is how much the SS were hated by the common soldiers. Always trying to solve everything with violence, behaving like bullies. It’s strange, isn’t it? The way most movies and books portray the war, you’d think every German soldier was a Nazi. But as usual, the people who did the dying were just regular folks. They weren’t too happy about the war, but they thought there was no alternative. They were wrong, of course they were, and absolutely horrific things were done because of that, but we shouldn’t forget that in every war, the people on the ground are just people. Like you and me. Like the people fighting in Afghanistan. That you feel the camaraderie of shared suffering, that the other side does terrible things, that you are an essentially kind human being with no desire to kill, that you love your country… all of that doesn’t mean you’re on the right side. It may mean that there is no right side, except the side of humanity. 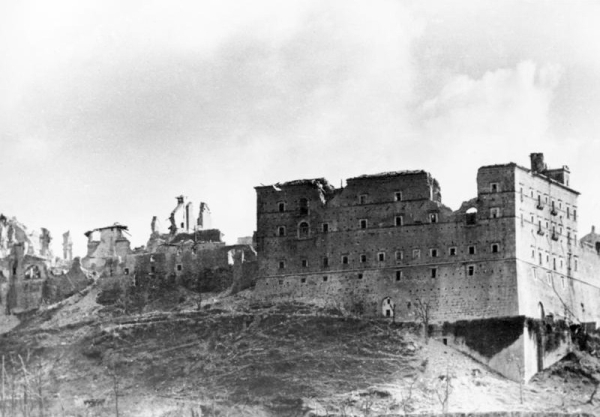 There was no reason to bomb Monte Cassino. There was also no reason for soldiers to be there in the first place.